The researchers' findings were published Sept. 25, 2014 in the journal Nature. The team was led by UMD Astronomy Professor Drake Deming, an expert in the study of exoplanets, or planets that orbit suns outside our own solar system. 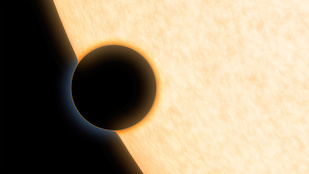 The finding of water vapor and hydrogen in the atmosphere of the exoplanet HAT P-11b is not only an astonishing piece of long-distance detective work, based on analyses of observations by three different NASA telescopes. It also suggests that astronomers' ideas about how the planets formed appear to hold true for other planetary systems, as they do in our own. How do scientists detect water in distant exoplanets? They use a quirk of light that happens when a planet transits, or passes in front of, its host star. Material in the planet's atmosphere absorbs some of the star's light, and that makes the planet appear bigger – similar to the way our sun seems bigger at sunset, when we are looking to the horizon across a broad swath of Earth's atmosphere. By plotting changes in the exoplanet's apparent size, and relating them to the wavelength of electromagnetic radiation that the telescope observes, astronomers get a graph that shows how much of the star's radiation the planet's atmosphere is absorbing. The shape of that graph, called a transmission spectrum, can reveal what chemicals are present in the atmosphere. The bigger the planet, the more obvious are the changes in the planet's size during its transit across its host star. Astronomers have used this technique to describe the atmospheres of several giant planets, the size of our solar system's Jupiter. 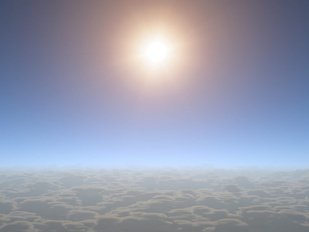 In this study, the team wanted to analyze the atmosphere of a significantly smaller planet. The team chose HAT P-11b, which was discovered by the Hungarian-made Automated Telescope (HAT) network. It's about four times the radius of Earth and about 26 times Earth's mass. Compared to planets in our solar system, HAT P-11b is closest in size to Neptune. But it is much closer to its host star and therefore much hotter, about 878 kelvins, or 1,120 degrees Fahrenheit. It probably has a rocky core, wrapped in a thick, gaseous envelope of about 90 percent hydrogen. Its atmosphere is cloudless at high altitude, but as the team found, it contains the signature of water vapor. UMD graduate student Jonathan Fraine, the paper's lead author, observed HAT P-11b using two NASA telescopes — the Hubble Space Telescope, which measures visible and near-infrared light, and the Spitzer Space Telescope, which records only infrared light — between July 2011 and December 2012. The team compared those data to observations by NASA's Kepler Space Telescope, which was launched to look for exoplanets and continuously records images of the portion of the sky where HAT-P-11b is located. Why do astronomers look for water on exoplanets? First, because water is a precondition for life – though the presence of water alone is not enough for life to arise. "The water molecule is widespread in the universe," says Deming. "Wherever you have hydrogen and oxygen, it naturally forms. Even some sun spots are cool enough to contain water vapor, although obviously it's far too hot for life on the sun." Astronomers also want to test the hypothesis that other planets formed the same way ours did. In the primordial solar system, particles of dust and ice carried native electrical charges that caused them to stick together, like household "dust bunnies" do, in a process called core accretion. Early in this process the giant planets that formed far from the sun had enough gravitational pull to attract large amounts of hydrogen gas – the H in H2O. "Our ideas about the formation of planets have been developed to match our solar system," explains Deming, "and we don't know whether other planetary systems behave the same way. We want to test the fundamental question of whether small planets are rich in heavy elements, like the oxygen in water vapor." The finding of water vapor and hydrogen on HAT P-11b "is a key piece of the puzzle," Deming says, consistent with astronomers' main ideas on the formation of planets. This research was funded by the NASA Astrobiology Institute's Virtual Planet Laboratory, the Space Telescope Science Center (Program #12449), the Millennium Institute of Astrophysics of the Millennium Science Initiative, and the Chilean Ministry of the Economy (Project IC120009). The content of this article does not necessarily reflect the views of these organizations. The research paper, "Water vapour absorption in the clear atmosphere of a Neptune-sized exoplanet," Jonathan Fraine, Drake Deming, Bjorn Benneke, Heather Knutson, Andrés Jordán, Néstor Espinoza, Nikku Madhusudhan, Ashlee Wilkins, and Kamen Todorov, was published in Nature on Sept. 25, 2014.